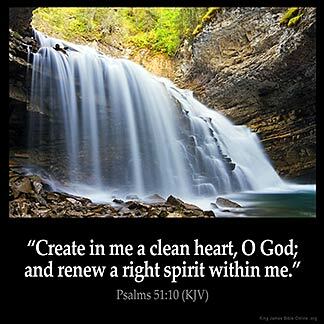 PSALMS 51:10 KJV "Create in me a clean heart, O God; and renew a right spirit within me." 7Purge me with hyssop, and I shall be clean: wash me, and I shall be whiter than snow. 8Make me to hear joy and gladness; that the bones which thou hast broken may rejoice. 9Hide thy face from my sins, and blot out all mine iniquities. 10Create in me a clean heart, O God; and renew a right spirit within me. 11Cast me not away from thy presence; and take not thy holy spirit from me. 12Restore unto me the joy of thy salvation; and uphold me with thy free spirit. 13Then will I teach transgressors thy ways; and sinners shall be converted unto thee. Create in mee a cleane heart, O God; and renew a right spirit within mee. Make a clean heart in me, O God; give me a right spirit again. A clean heart prepare for me, O God, And a right spirit renew within me. (51:12) Create me a clean heart, O God; and renew a stedfast spirit within me. 51:10 Create - Work in me an holy frame of heart, whereby my inward filth may be purged away. Right - Heb. firm or constant, that my resolution may be fixed and unmoveable. Spirit - Temper or disposition of soul. I love this because you 're reminds me of how God gave his life for us and that he loves us and cares for us really much and that we He gave us or so because he is the one that can give us everything that we need he gave us our soul because he cares for us and that we need to love him because he loves us and we knew of other people because he first loved us. This will become my prayer daily, I believe this will help me to be the person God has created me to be,Old things has pass away. It reminds me that I need help from God "One Day At A Time. "